To date, the PMC Kids Ride Program has raised more than $9 million for the PMC, which has donated $654 million to Dana-Farber since 1980. This year, PMC Kids Rides hopes to raise $1 million as part of the organization's fundraising goal of $58 million. PMC Kids Rides participants have a fundraising commitment of $30 and are asked to raise money by requesting contributions from family members, friends and neighbors. A registration fee of $10 or more is collected from each participant. The 2019 PMC Kids Ride fundraising goal is $1 million and 100 percent of all rider-raised goes directly to Dana-Farber Cancer Institute. Every donation makes a difference! If you know a child in treatment at the Jimmy Fund who is interested in being a PMC Pedal Partner for a PMC Kids Ride, please contact Susan Doucet PMC Pedal Partner Program Coordinator. Start a Ride in Your Town! PMC Kids Rides can be held anywhere there are safe roads and kids with bikes! Planning a PMC Kids Ride is a fun and rewarding way to get your community involved in the PMC mission: finding a cure for cancer through athletic-based fundraising. The Pan-Mass Challenge raises money for life-saving cancer research and treatment at Dana-Farber Cancer Institute through an annual bike-a-thon that crosses Massachusetts. Since its founding in 1980, the PMC has successfully melded support from committed cyclists, volunteers, corporate sponsors and individual contributors. All are essential to the PMC's goal and model: to attain maximum fundraising efficiency while increasing its annual gift. Our hope and aspiration is to provide Dana-Farber's doctors and researchers with the necessary resources to discover cures for all cancers. The PMC donates 100 percent of every rider-raised dollar directly to Dana-Farber and is the institute’s largest single contributor, raising more than 54 percent of the annual revenue at The Jimmy Fund®. In 2018, the PMC gave a record gift of $56 million to Dana-Farber, the largest ever donated to the institute by an organization, bringing its 39-year contribution to more than $654 million. The 2019 Pan-Mass Challenge – August 3 and 4, 2019 – is the 40th PMC. 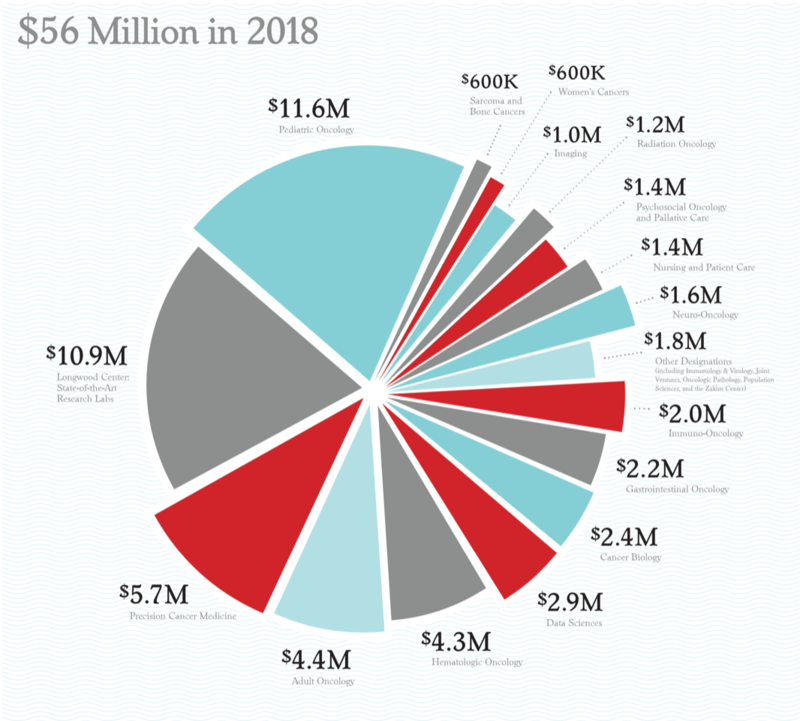 The PMC's 2019 fundraising goal is $58 million. As an affiliate of Harvard Medical School and a Comprehensive Cancer Center designated by the National Cancer Institute, Dana-Farber also provides training for new generations of physicians and scientists, designs programs that promote public health particularly among high-risk and underserved populations, and disseminates innovative patient therapies and scientific discoveries to our target community across the United States and throughout the world. Dana-Farber Cancer Institute's ultimate goal is the eradication of cancer, AIDS, and related diseases and the fear that they engender. Above all else, Dana-Farber makes a difference by relieving the burden of disease now and for the future through our research, clinical care, education, outreach and advocacy. Click here for Patient Referral Information. Since 1980, the Pan-Mass Challenge has raised $654 million for Dana-Farber Cancer Institute. Read about how the PMC's 2018 $56 million gift is making an impact. For four decades, you have taken us on an amazing ride! Since 1980, the PMC’s partnership with Dana-Farber Cancer Institute has generated a staggering $654 million to foster adult and pediatric patient care and research at the Institute. So, it is fitting that this year’s 40th anniversary is represented by the ruby, a gemstone that symbolizes eternal commitment. A special thanks to Billy Starr and everyone on the Pan-Mass Challenge team for your tireless efforts, organizing and contributing to this amazing feat year after year.